Lovely to see you found time to make some cards Lucy and I love both of these, that Dragonfly die is stunning! Fantastic cards! The dragonfly is stunning and the little mouse is so adorable! eep! Your dragonfly is absolutely gorgeous and your mouse = stinkin' ADORABLE. Both cards are beautiful... but that dragonfly is STUNNING! Your dragonfly is gorgeous! What a great idea. I really missed seeing your beautiful cards! So happy! wow the dragonfly card is stunning! You do the clean and simple style so well. I love these cards. Thanks. Love your sweet cards. That dragonfly is awesome and the mouse is adorable! Oh, the dragonfly is just stunning! Simple but elegant. Thanks for sharing your talents with us. Blessings on your day! The dragonfly is just amazing! Your dragonfly is beautiful! And the mouse is adorable. Love Hero Arts! The dragonfly card is so beautiful, and the mouse card is so simply sweet and adorable. Definitely two of my favorite cards from the blog hop. Your dragonfly is stunning & I adore that darling mouse! Wonderful cards!! your dragonfly is so dainty and pretty. Absolutely beautiful! Love dragon flies and especially how you treated this one! Lovely cards! I love all the sparkle and shine! Great cards but the dragonfly one is a must do this! Hi Libby, Thank you for sharing. Love your cards. Your dragonfly is simply gorgeous! That dragonfly is so pretty, you are very talented! Your dragonfly is amazing and just love the cute mouse! Such cute cards.. The colors you used is my favorite colors!!!! Gee, how did you know??? LOL The dragon fly card is so pretty. I like how you used the clear glitter mix and the clear iridescent jewels. Very stunning!! Love your cards, especially the dragon fly card!! Love the colors and that dragonfly! The dragonfly is amazing! Beautiful projects. I love your color choices, Lucy! Such simple and wonderful cards! I cannot believe my eyes...I've never seen such a pretty bug! Wow! Thank you for sharing your talent! Oh my goodness Lucy, what a gorgeous dragon fly! And that mouse??? Seriously adorable! You folks have rocked this catalog release. So much goodness all in on catalog...EeeeK! The dragonfly is spectacular with the soft watercolor and all the shine. LOVE your cards!!!! The mouse is fantastic and so simple and sweet. The dragonfly is absolutely elegant and magical looking - thanks! The mouse slays me every time. I love the little speckles in the back. What did you use? That dragon fly is perfection! Great cards - the dragonfly is stunning and the mouse really cute! I really love the intricate and lacy look of your dragonfly so pretty. Love the cards! Great new release! WOW ! Your dragonfly's card is gorgeous ! I love the colors and how you use the die cut to re-create the delicate wings. And your mouse is also adorable. It's really two fantastic cards. Thank you for sharing. So beautiful - love the soft colors. The dragonfly is so delicate and pretty. That dragonfly is stunning! Absolutely beautiful! Love your cards, they are stunning! Love the dragonfly! Your glitter and sequins really makes it pop! Thanks for sharing. Such cute cards!! Adore the sparkly dragonfly!!! The dragonfly card took my breath away! Love it! I love your cards, the dragonfly is so simple and elegant, and the mouse so cute. You have taken us out of the hop with a bang! What gorgeous cards - I love that dragonfly! Love these cards, especially the gorgeous sparkly dragonfly! Love the cards. The dragonfly one is so pretty. How delicate that dragonfly looks! Goregous! The dragonfly is such an elegant card and the mousy is too cute. Love them both. I love the 3D dragonfly. Have missed your cards! Happy to see one, beautiful as always! 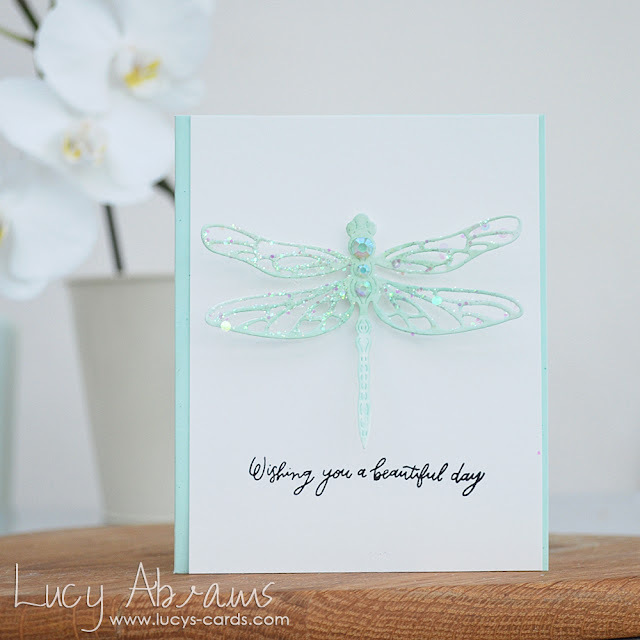 Gorgeous dragonfly and super cute mouse, love your pretty cards! Lovely dragonfly and Adorable Mouse with Tea! Such Fun! The dragonfly was gorgeous. Great job. Love the detail. I love your CAS elegant dragonfly card! Lovely to see some of your creations - that sparkly dragonfly is to die for! So pretty, Lucy! Thank you so much for the Hop, the inspiration, and the chance to win! That dragonfly is amazing! Very sweet cards! Two Beautiful clean and simple cards! Ok, this is one instance where a dragonfly is truly a damselfly! Love the dainty look you accomplished!! I love the dragonfly card. The sparkles give it that extra something. I also like the mouse card. Thank your for sharing your amazing talent. All your designs are beautiful! I love the mice! I think it's going to be my first purchase from the new Hero Arts release. Great job! W O W! That dragonfly die cut looks so beautiful and elegant! You did an awesome job! Your dragonfly is SO beautiful and magical......I LOVE the color and the sparkle!! Your dragonfly card is simply stunning! So simple but elegant!! I also love the cute little mouse! Lucy your CAS dragonfly card is super magical and amazing. Love the colours the single die cut and sentiment all in one. Stunning! I like your CAS mousie card too. It's super cute. Thanks for sharing .... love your style. What great cards! That dragonfly is absolutely gorgeous! and I love that little mouse! Thank you for sharing your creativity with us! Gorgeous dragonfly card and cute mouse card. That butterfly card is just stunning! 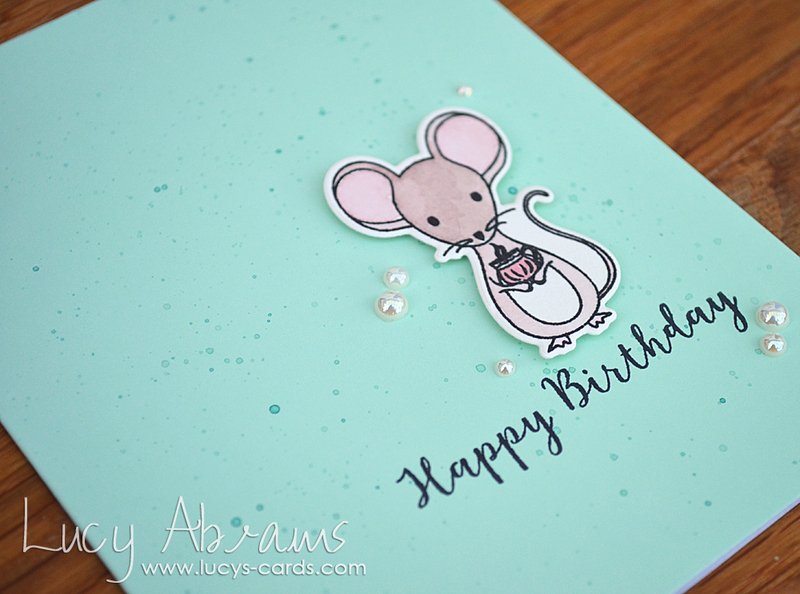 And then you go and make such an adorable cute mouse card. Thanks so much for sharing. SO pretty! Love that dragonfly!! Such lovely cards and my favorite color! That dragonfly is gorgeous!!! Love the color and the sparkle! And that little mouse is so adorable!! Your dragonfly is stunning and that mouse, omg, he's adorable! WOW that dragonfly card is simply gorgeous! Lovely cards! Not fussy but definitely heartfelt! Lovely cards...the dragonfly is gorgeous. Thanks! Your dragonfly card is just stunning! CAS elegance at its best! Such simple, elegant cards. Beautiful. Love the simplicity of your cards! The dragonfly needed nothing more and is stunning! And the splatters and pearls added just the right touch to the cute mouse. Good work! The dragonfly card is gorgeous and love the cute mouse card. Thanks for sharing..
Ok, I am so in love with your dragonfly card!!! I adore dragonflies so I'm loving your first card. Both are lovely. Love both cards, but that dragonfly is amazing!! Thanks for the inspiration! Fabulous cards! Love that gorgeous dragonfly! Beautiful color and embellishments! Adorable mice too! That dragonfly is so delicate looking, really pretty! You definitely gave us two completely different yet wonderful cards. The dragonfly card is stunning with all the gorgeous sparkle and then there's the mouse card that is simply absolute cuteness. Love them both! Oh how pretty! I love both cards but the dragonfly one is undoubtedly something special! Beautiful cards, I love the dragonfly card. Thank you for sharing. Beautiful dragonfly and adorable mouse. Love your cards. Your dragonfly is magical. So pretty. WOW! Stunning butterfly, extremely elegant. Your mouse card is simply adorable. Gorgeous cards--I love the pretty dragonfly! I like your CAS style. I can't pull that off. Thos cute little mice are tickling my funny bone. 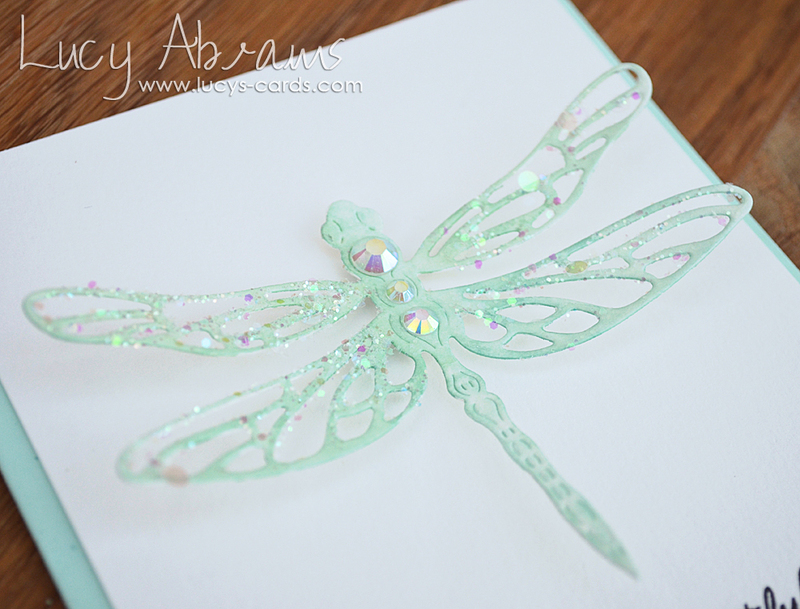 Love the color and subtle sparkle of the delicate dragonfly and the mouse is such a cutie-pie! Fantastic cards! I love how both are sprinkled with just a touch of bling. The dragonfly is amazing. It is so delicate and beautiful. Also the mice are darling. Thanks for your hard work! every time, I just love thewe little mice! Well that dragonfly card....all I can say is ..STUNNING!! Your second mouse card is adorable!! Wow! I didn't realize how large that dragonfly is until I saw your card. As someone who mostly makes 5x7 (A7) cards, I appreciate the size of that cutting die. I enjoyed both of your cards. Love, love, love how dreamy and delicate your dragonfly turned out. TFS. The dragonfly card is awesome!!! That dragonfly is just so delicate and sparkly, so pretty! Two different designs but equally great ! I love your choice of colours as well ! Beautiful cards! The dragonfly one is a stunner! Two beautiful cards, the dragonfly is my favorite. Thanks for sharing! Your dragonfly is stunning! So much glittery goodness!!! TFS! Simply elegant. Love your cards. Beautiful CAS cards..love both of them.. The dragonfly is very pretty and the mouse is cute. Great cards. That dragonfly is stunning! I love the color you achieved with the watercolors and the touches of sparkle are dazzling! I can't get over how cute that mouse stamp set is! That dragonfly card is gorgeous! I love the blue color and all the sparkle! That mouse is adorable. Fantastic job! I always feel a little bad for the person at the end of the blog hop. I want to yell across the internet "I promise; I'm coming!" So while it's a little while after posting, I'm glad I made it to you. That dragonfly is so delicate and gorgeous, and I love that little mouse tea set as well. So cute, and I love your coloring. Thanks so much for sharing! Wow! They saved the best for last! I love the dragonfly die cut you did!! First time to ever complete the hop! Yes! Thank you for sharing your wonderful talent! Love your sparkly dragonfly! Hero Arts has some great products. Their catalog is gorgeous! Thanks everyone!! Would you do a video on how you made the dragon fly please? Oh my stars! I love your cards! I have to have some sparkles!!! the dragonfly is absolutely gorgeous! Two gorgeous cards to finish the blog hop - love the choice of color on the dragon fly and that sentiment is so right for the dragonfly size on the card - the mice is winking at me - I think he wants to come to my place soon. Great cards and thanks for sharing. Dragon fly is so beautiful and color you picked is perfect ! Loving the adorable mouse too! Fabulous cards! I love the sparkle and shine of the dragonfly. So pretty! And that mouse is so cute. That set has really grown on me!Love it!! Gorgeous cards and the Dragonfly is stunning! Wow, what a great idea to use glitter on the wings, it looks so real. Thanks for you time and effort. Beautiful cards! The dragonfly accents are gorgeous! Love your sparkly CAS designs!! Thanks for the inspirations. Wow Lucy that dragonfly looks so fantastic! I need to get one of those! That mouse card is super cute also. Love your cards, and the colors are scrumptious! The dragonfly die looks like a must-have to me!